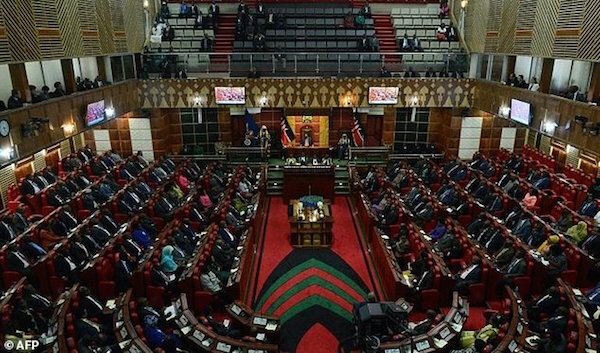 Kenya’s High Court on Wednesday gave parliament 60 days to enact legislation that would make it obligatory to have more female lawmakers, or face dissolution. The 2010 constitution requires that no more than two thirds of lawmakers should be men, a principle hailed at the time as a big step towards equality. High Court Judge John Mativo said that by failing to pass the required law, parliament was guilty of a “gross violation” of the constitution. “Parliament has a constitutional obligation to enact the requisite legislation and failure to do so within the stipulated period is in my view unacceptable and a blatant breach of their constitutional duty,” he said, according to a copy of the ruling seen by AFP. While Kenya’s last election in 2013 landed more women than ever in parliament with 68 of 349 seats in the National Assembly, the country still lags behind much of the region in opening up politics to women. World leader Rwanda has 61.3 percent of women in its lower house of parliament, followed by Ethiopia with 38 percent, Burundi with 36 percent and South Sudan with 28 percent, according to the Geneva-based International Parliamentary Union. The improved showing of women in 2013 was largely due to another constitutional provision requiring that 47 “women representatives” be elected. Kenyan analyst Nanjala Nyabola wrote recently that this had actually taken female politicians backward, as they were seen as only present to deal with women’s issues rather than participating as “full parliamentarians”. “The constitution… has been enforced, it has been brought alive in this judgement and we have been reminded as a people that this is the constitution we all aspired for,” he told reporters after the hearing.